So they're all going to be zen masters? It's easy for you to talk about subtracting intereference from the equation, but it just isn't so. There are thousands of processes going on in your body at any given moment, not to mention any brought on by external circumstantial and emotional sources, and you're telling me that is of no concern? You're skimming the surface of the issue and ignoring the real problems with it. I've enjoyed this discussion, but I believe you are dealing with this superficially. I never said, "intereference", as you are phrasing it, was not a concern. I would use the term distractions, however. I said that distractions can be dealt with by using your consciousness and awareness to overcome them. Your consciousness is the most fundament part of what makes you, you. So, I am certainly not skimming the surface of and ignoring the real problems with the issue. It is people that are overly distracted that are ignoring the real problems. reality how? I'm sorry to break it to you, but stereo by its very nature is not reality, it is perception. Stereo is about tricking your mind. It is illusory by design. If you read what I wrote again, you would notice that I said reality would be the factors that make up the stereophonic soundstage which include: soundstage height, width, depth. Imaging, detail, etc. etc. A stereophonic image is the illusion of two independant audio signals on the left and right combining to make a stereo one, but just because it is an illusion doesn't make your perception if the imaging, soundstage height, width, and depth and detail of the signal any less real does it? Just because a magician uses an illusion to make you think that he cut a lady in a box in half doesn't make it any less real that you witnessed his illusion, correct? Is you sitting in the audience witnessing this illusion not reality? Or are you saying that you would't really be in the audience because what the magician is doing on stage is just an illusion? I've already answered this, and made it abundantly clear. In case I haven't, take this example: a screwdriver was never intended to do anything but drive or remove screws, yet they sure do a great job opening a can of paint. Ray gave a good example to answer this, so I won't bother. I hope you didn't mind my taking the time to expound on your questions in some length. As I said, I found your questions to be valid and informative for those interested in serious discussion about this topic. How do you see implementation of this process? I would assume they need to be independent evaluators. If they were employed by manufacturers that would pose obvious concern. It seems recording studios would be the ideal vector for such a system. If they are indeed independent "review houses," do you see them meeting some regulatory standard? How could it be met and verified (if not by abx)? And this begs the question of what kind of economic viability would a company like this have? Although this could be moot if it is not a structure you have in mind. Also, to the point of recording variability, wouldn't there have to be some common material used at EVERY audition to establish some sense of baseline? Moreover, since many descriptors are relative quantifiers (deep, wide, light, heavy, more, etc. ), what would be the relative control, or the standard, from which relative quantifiers would be deriving their delta? I never said, "intereference", as you are phrasing it, was not a concern. I would use the term distractions, however. semantics, i believe we are talking about the same thing. I said that distractions can be dealt with by using your consciousness and awareness to overcome them. so are you saying you are aware of all the distractions bombarding your psyche at all times? And what more, are able to ignore them all to be able to focus so precisely on a task as to notice nothing else? Excuse me if I don't believe you. You certainly ARE skimming the surface if you think that simply saying a person can always block out interference/distractions at all times. Either that or just ignorant to the complexity of human psychology and physiology, which I could never fault anyone for.Most people are unaware of all the mood affecting interference that is constantly happening. In the case of stereophonic audio, reality would be the factors that make up the stereophonic soundstage height, width, and depth, imaging, detail, etc. etc. now I've read it four times. It's still not reality. It is, as you admit, is an illusion. A stereophonic image is the illusion of two independant audio signals on the left and right combining to make a stereo one, but just because it is an illusion doesn't make your perception if the imaging, soundstage height, width, and depth and detail of the signal any less real does it? sorry, but that is in fact exactly what it means. Just because a magician uses an illusion to make you think that he cut a lady in a box in half doesn't make it any less real that you witnessed his illusion, correct? that doesn't make sense as an analogy. The fact that we are hearing an illusion is not an argument for the illusion itself being reality. It does not follow. There is no debate about hearing an illusion or not. A hypothetical person with two working ears, in reality, is hearing a stereo image, but that does not mean what they are EXPERIENCING ("the factors that make up the stereophonic soundstage height, width, and depth, imaging, detail, etc. etc," in your words) is reality. They are experiencing an illusion, and an illusion by it's very definition, is NOT reality. Would you have me believe that, since I am in reality witnessing a woman being sawn in half by a magician, the woman is ACTUALLY cut in half? Following your logic, whatever perceptions I experience in reality must they themselves be reality as well. Obviously this is just plain wrong. [/B] Is you sitting in the audience witnessing this illusion not reality? Or are you saying that you would't really be in the audience because what the magician is doing on stage is just an illusion? , is in fact a valid one in my point. Although the analogical inference was taken a bit too seriously, I will continue in that vein. DK, you brought up a correct point that there is a specific tool better devised for the specific point of opening a can of paint. Point taken. However, just because a tool is developed for a specific purpose does not mean it is inherently better than a repurposed one. I can think of several reasons why a person might prefer a screwdriver over a paint can opener: convenience, multi-function, cost, etc. Additionally, the rebutal only works if you accept that the trained listener method is the "superior" paint can opener. And, it may be exactly that, I'm just not sold. But at this point its superiority is just conjecture. Although, with your research that is less and less the case. The point you missed that DK pointed out is the repurposed tool (screwdriver) didn't do as good a job as the original purposed tool. In some cases it was detrimental by creasing the lip of the can causing air to dry out the paint. I didn't miss it, I just didn't address it directly. I'll do that now for you. I could argue that the method I use with the screw driver has as few marring occurances as DK's special tool. Additionally, if I add a few wraps of scotch tape around the tip, occurances drop to even fewer. I don't think this analogy is going to hold my interest much longer but its good to see you debating the analogy rather than accuse me of being irrelevant for talking about screwdrivers and paint cans. Maybe syndil just had you worked up. I don't mind at all, in fact I appreciate it. It's good to hear that side of the training. Your question highlights one of the biggest aggravations in the field of stereo systems evaluation: There are no mandatory recording quality standards and there are no mandatory evaluation standards. Record companies decide whether they want to make a product with high sound quality or one with mediocre or poor quality. If this process was implemented, there would have to be recording standards adopted against which recordings could be evaluated. As it stands now, the best we can do is adopt a standard lexicon to describe what is heard and a standard procedure to document the spatial and other sound characteristics of a particular recording on a particular stereo system. I would like to see the adoption of standards for producing and evaluating recordings, but I realize that is unrealistic. What I advocate is listener training so that they will be able hear and accurately quantify the differences in stereophonic equipment performance. This training would involve exercises in sound localization and the use of a lexicon of descriptive terminology to describe and document what is heard. 1. There is no consumer demand for high quality recordings. No one wants to watch a TV with a fuzzy, out of focus picture. It would be intolerable. Most people do not care if a stereo system has a fuzzy, out of focus sound stage with poor image specificity. Indeed, most people can't tell the difference between a one system with poor image specificity and a system with good image specificity. 2. Most people are not serious listeners with an orientation toward high quality recordings played on high quality stereo systems. The standard is the real thing being represented by the illusion. A real apple can be placed next to a high definition video recording of the same apple and it can be seen how close the recording is to the real thing. One can listen to a piano solo and then listen to a stereophonic recording of the same performance and gauge how accurately the illusion represents to the real thing. Comparison does not have to be done on a "realism" basis. Realistic portrayal is not always the most desirable. This is why television and movies are produced under a lower color temperature (approximating indoor lighting) than the more realistic color temperature of the sun. A woman's properly made-up face will typically look good under indoor lighting. If the same made-up face is seen under sunlight...well...it's a different story. Absolute realism is not always the goal of the audiophile. If someone has never heard a real orchestra in concert, can their evaluation of two audio components playing orchestral music be relevant...or trusted? Of course it can, as long as the evaluator makes it clear that the sound of one component is being evaluated against the other rather than against the sound of the actual live performance. In such an evaluation, the listener would document differences in stereo performance rather than deviations from the real thing. DK, you brought up a correct point that there is a specific tool better devised for the specific point of opening a can of paint. Point taken. However, just because a tool is developed for a specific purpose does not mean it is inherently better than a repurposed one. I can think of several reasons why a person might prefer a screwdriver over a paint can opener: convenience, multi-function, cost, etc. In the case of a re-purposed tool, if it completes the task with no detrimental effects, it is just as good as the original specialized tool. 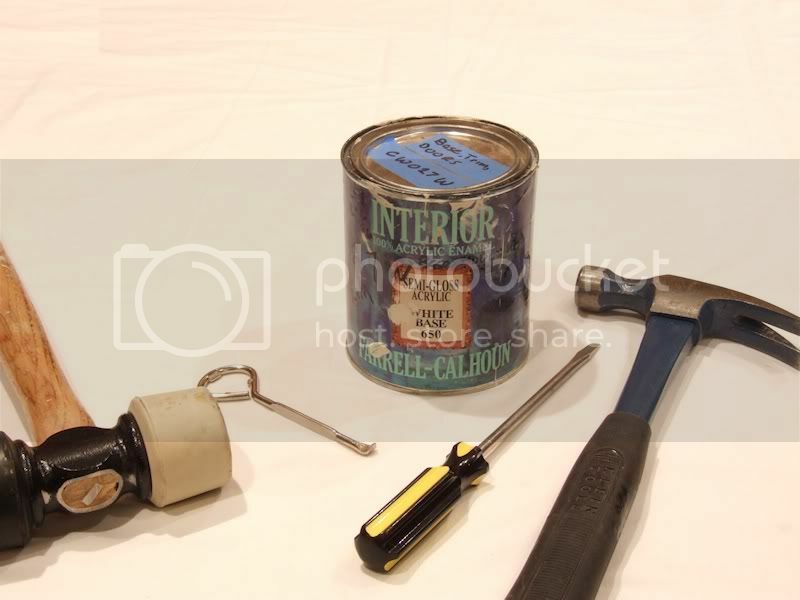 In the case of using a screwdriver to open a paint can, the screwdriver's inappropriately applied leverage and contact points get the can lid off, but with damage to the lid. The can of paint above is used to touch up my home's doors and trim and was purchased in 2002. The can is now 1/3 full and the paint is still nice and liquid as there are no openings for water to evaporate. The lid lip is still perfectly round and makes a tight seal with the can's top rim. 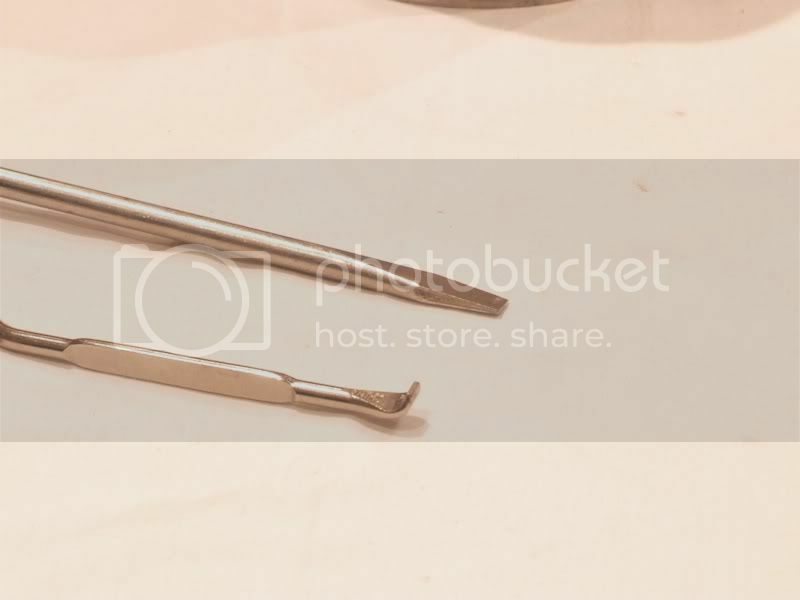 The rubber mallet and paint can opener on the left are used to open and close the can. The tools on the right will work, but will beat up the lid. I am not an expert on paint can tools, but I imagine the special paint can lid removal tool is curved for a reason. If someone wanted to improve on the design of the specialized tool, I would think a better curved blade design would be offered rather than deviating toward the flat blade design of the screwdriver. Additionally, the rebutal only works if you accept that the trained listener method is the "superior" paint can opener. And, it may be exactly that, I'm just not sold. But at this point its superiority is just conjecture. Although, with your research that is less and less the case. Two Bell Telephone Laboratories scientists, F. K. Harvey and M. R. Schroeder, presented a paper at the 12th Annual Convention the the Audio Engineering Society on October 11, 1960 ("Subjective Evaluation of Factors Affecting Two-Channel Stereophony", Journal of The Audio Engineering Society, Vol. 9, No. 1, January 1961, pp. 19-28). In relation to your question of establishing standards for stereo evaluation, we see that this was the intent of Bell Laboratories scientists. Regrettably, as it was in 1961, so it is today: "...only a small percentage of people fully appreciate high fidelity. Even less appreciate or understand stereo." The stereo system evaluation method I use is based on spatial mapping of the sound stage, laterally and aerially, and describing the character of sound images within the sound stage. A basic scientific principle is that things should be tested under conditions representative to how the thing will be used. Another principle is that test methods must provide relevant data. 1. Does the protocol make sense within the context of stereophonic sound? 2. Will the data generated by the test produce repeatable results pertinent to stereophonic system performance parameters? Maybe syndil just had you worked up. I think it was I who had Syndil worked up. This was all very interesting. It's always fun to have a spirited debate that dips into the philosophical. It is obvious you are passionate about the process, and while much of it, as you assert, is impractical from within the context of a modern audio business model, it draws attention to several issues wherein lies room for improvement. At the very least, I understand your position more clearly. I certainly feel warmer towards the concept, as well. OH! So this is YOUR fault! Means just once around here, I'm off the hook. If I were able to be aware of all distractions all the time and overcome them, I would be perfect which I am not. I am able to be aware of more distractions than an average person and can overcome them for short periods of time in order to complete a task, which would be listening to the differences in audio equipment for the situation we are talking about in this thread. Again, you added the word all to what I was saying. You are making absolutes, while I am not. I am not listening to and comparing stereophonic audio equipment all the time, right? I am quite possibly more aware of certain physiological and phychological processes and how complex they are in humans than you. I have had diabetes for 27 years and have studied and become aware of physiological effects of the breakdown of foods (specifically carbohydrates) and the effect on human (specifically, me) physiological and psycological processes. I deal with many more distractions than the average person and have learned how to overcome much of them for short amounts of time, when necessary. And, I am probably more aware of all the mood affecting distractions than the average person due to the above. Also, I never asked you to believe me. I am simply stating what I feel is truth. It may not be truth for you and that is fine. What part did I leave off in the quote? It looks complete to me. One of the factors that make up stereophonic audio are sound waves. Since you physically hear soundwaves both by the waves shaking the floor, couch and potentially walls, etc. and your ear drums physically move as a result of sound waves these sound waves make up your perecption of the stereophonic audio soundstage width, depth and height as well as the detail and imaging, etc, etc, etc. and as a result is what makes up the reality of what you are hearing as a listener. I know that's what it means and that's why I said it. Just because a magician uses an illusion to make you think that he cut a lady in a box in half doesn't make it any less real that you witnessed his illusion, correct? Is you sitting in the audience witnessing this illusion not reality? As you read, I said that you witnessed his illusion. That is what is real; you witnessing his illusion. However, how you percieve him cutting the woman in half is reality. That may be a different perception for many different people. Or, it may be the same for all people. This depends on how distracted the people witnessing the illusion are, correct? How distracted the audience members are while perceiving makes up each individuals reality. You can then apply that to stereophonic audio. I didn't say that you were arguing that sitting in the audience is not reality. I asked if that's what you were arguing. The audience members perception is not the illusion (assuming they are not distracted), they are perceiving an illusion. The act of perceiving the creates the audiences reality, but what they are perceiving is an illusion (the woman being sawn in half). I think I have stated my view of the last part of your statement pretty well above and if you need to, read it again. I opened the can and extended a measuring tape to the paint surface. The can is 5" tall. From the top of the can to the paint surface was 3.25". 5" - 3.25" = 1.75"
1.75"/5" = 0.35 ~ 1/3. 1/3 full = 2/3 empty. The above is in regard to paint. In absolute terms, the can was completely full: 1/3 paint + 2/3 air. You may be thinking of a container 1/2 empty = 1/2 full. In absolute terms, a container 1/2 full of liquid is actually completely full: 1/2 liquid + 1/2 air. Okay, so I have been sitting back and taken in what has been said in this thread. However, at this point I offer some thoughts and questions. First, it seems that the crux of the matter is whether or not bias can be removed through training, and therefore whether blind testing is necessary or not. DK agrees that the results of a properly executed blind test are valid, so it's more a matter of whether it is a necessity. DK and the "inventors of stereophonic audio" believe that bias can be eliminated through training, whilst some others (including me) aren't so convinced. Now, unless I missed something, I am not aware of any studies that actually test the validity of elimination of bias through training. In my mind, there is a fairly simple way to test this. You would need to get some listeners who are trained in the art of stereophonic listening and subject them to both blinded and unblinded trials. Both parts of the study would need to be done properly and in the same way if the results are to be valid. By properly, I mean adequate evaluation time, notes, and only one person tested at a time while seated in the "sweet spot." In addition, the blinding would need to be done in a way that doesn't affect the sound field, and therefore, the results. The results could then be compared and a determination could be made as to the necessity of blind testing. I doubt a study like this will ever be done, but I hope I'm wrong on that. I don't have time right now to go through every issue you raised, but I think I can speak generally and get my point across. 1. While you didn't use absolutes (I inserted them for you), the only way that I can see your argument about the human taking control or ignoring the interference (or distractions) being able work is if it is ALL or MOSTof the interference in the matter of our discussion. Otherwise there is no relevance to the initial discussion. 2. You do an awful lot of making me read stuff (definitions, quotes, etc.) that does not prove your point, and in fact only bolsters mine. 3. I am not twisting your words around, you logic is doing that for you. You misinterpret statements, argue unrelated issues, and presuppose things unscientifically. You assert that humaned have an innate consciousness that allows us to block out the necessary amount of interference as it pertains to audio. Hardly logical, and hardly provable. 4. Your argument is completely illogical. We're talking about the the perception being the illusion, and you're saying that act of perception is reality. So what? It is a gross fallacy. Stereo is an illusion, your perception of stereo is an illusion. it is not real. While you may be sitting ther in reality, and in fact be subject to the perception in reality, that does not change the fact that the perception (the main issue) is an illusion. there is no source of sound ouside of the speakers. there is no drum, no guitar at stage left, no singer in the middle, but you perceive it to be there. DK, I'd like to see some results of paint can opening devices that involve comparisons between a proper can opener and a quality screwdriver: get rid of the Stanley screwdriver and replace it with a quality Klein-level tool. Otherwise, all results will be considered null and void. Uhm .... you're probably right. Actually enjoyed reading all 11 pages of this discussion. Valid points/counter-points allaround, very interesting. If you test using multiple bias in so many different realms and sufficient numbers you potentially would start to see bias drop out as being much of a factor. That's a nice try to get out of making your counter-points, but I'm sorry it won't work. You'll have to be much more specific than the above in ALL points.............. Sorry if you don't like taking the time to learn the definition of perception and reading my quotes. Perhaps that is why you are not understanding what I am saying you you feel my logic is twisted? Please address ALL of my previous post specifically, and directly (when you have the time, of course). First, it seems that the crux of the matter is whether or not bias can be removed through training, and therefore whether blind testing is necessary or not. DK agrees that the results of a properly executed blind test are valid, so it's more a matter of whether it is a necessity. 1. ALL people have biases. 2. The ONLY way to remove bias is through blinding. Here, the bias(es) are product knowledge such as price, brand and aesthetics. A. There is no evidence that 100% of humanity is affected by visual bias. B. Of those people affected by visual bias, there is strong evidence that its effect can be eliminated through training. Notice I said that the effect of the bias can be eliminated. Eliminating the bias itself may be possible, but it is not absolutely required. C. There is evidence that shows that people are able to overcome much more severe forms of bias such as racial prejudice and misogyny. If we accept the theory that people cannot be trained to eliminate or ignore biases, we must also accept the fact that people cannot be reformed from negative behaviors influenced by irrational biases, which is absurd. It is easy to find accounts people who grew up in racist ideology, but later reformed, overcame their biases and went on to form friendships, marriages and business relationships with people who formerly would have been objects of their hatred. It is easy to find accounts of vicious pimps who grew up hating their mothers and all women, but who later reformed, reconciled with their mothers, and went on to establish stable marriage and family lives. In light of the extreme examples of the reformed racist and the reformed pimp, I do not see a basis for believing that people cannot be reformed to ignore visual biases when evaluating products. Indeed, such reformation through training is a standard concept in the fields of stereophonic audio, television and economics. In post #185, I provided evidence where the standard practice for professional evaluation of televisions is non-blind trials, but when untrained evaluators are used, television trials are done blind. DK and the "inventors of stereophonic audio" believe that bias can be eliminated through training, whilst some others (including me) aren't so convinced. Based on the evidence provided in post #185, you should also add television set evaluators to the list of those who believe bias can be remediated through training. Again, it is not necessary to eliminate bias. It is the effect of bias that needs to be eliminated. In post #141, I gave the example of my strong visual bias against silver colored components and against speakers clad in oak trim. Neither of those biases prevented me from selecting silver components and from selecting two sets of large size speakers clad in oak. In the first picture in post #141, a black SACD player rests on the equipment cabinet top. The Cary Audio CD 306 PV SACD player comes in black and silver finish. I chose black per my preference and bias. Now, unless I missed something, I am not aware of any studies that actually test the validity of elimination of bias through training. Have you looked for such information yourself? There is a whole world of knowledge beyond the confines or our august forum. The field of consumer research is full of examples of consumer bias being eliminated or the effects of such bias being eliminated through training and education. "Firms often shroud the negative attributes of their products, particularly high prices for complementary add-ons. Therefore, in the field of economics and consumer research, the concept of the "debiased" consumer is well established. "Debiasing" occurs when a biased consumer learns to eliminate, or eliminate the effect of, their biases. The concept of debiasing is also well established in the fields of stereophonic audio and television. It is only within a certain subculture within the stereophonic audio community that the concept of training to remediate biases is not accepted. In my mind, there is a fairly simple way to test this. You would need to get some listeners who are trained in the art of stereophonic listening and subject them to both blinded and unblinded trials. Both parts of the study would need to be done properly and in the same way if the results are to be valid. By properly, I mean adequate evaluation time, notes, and only one person tested at a time while seated in the "sweet spot." In addition, the blinding would need to be done in a way that doesn't affect the sound field, and therefore, the results. The results could then be compared and a determination could be made as to the necessity of blind testing. This is something you and an accomplice can do yourself. I and others in this thread have mentioned that we have done this. I am glad that you realize that such a study must be done properly within the context of stereophonic audio. I doubt a study like this will ever be done, but I hope I'm wrong on that. You don't have to wait for someone else to do it. If the reports of members of this forum are not credible evidence for you, do your own study and report your findings. Blind tests are required when the possibility that a test participant's bias(es) might affect experimental results and when training to remediate those biases is impractical from a time and economic viewpoint. Evidence has been provided that debiasing consumers is an established practice in stereophonic audio, television and economic research. The question now might be "why isn't the concept of debiasing applied to medical trials?". Training medical professionals and patients to overcome biases would be time consuming, impractical and unrepresentative of the way medicine is administered in actual practice. For the serious listener (audiophile), debiasing is a required part of becoming proficient in evaluating stereophonic audio equipment. For the serious viewer (videophile), debiasing is a required part of becoming proficient in evaluating video equipment. For the serious consumer (shopper of anything), debiasing is a required part of becoming proficient in evaluating merchandise with regard to its true value. For the seriously or terminally ill patient, taking the time to debias them could result in grave consequences. [pun intended] Furthermore, it is doubtful that such patients would be in a frame of mind to undertake such training. For the medical researcher working toward a market deadline, taking the time to debias themselves and subjects could result in economic penalties due to delay in patenting and marketing a treatment. Furthermore, it is doubtful that these medical professionals would be in a frame of mind to undertake such training. How did I try to get out of it? I dealt with most of your statements and made my counterpoints just fine. I don't need to take the time to read the definition of the word perception. I know what it means. Between the two of us, I am certainly not the one needing the vocabulary lesson. You still, even after posting the definition(! ), are misusing it as a concept. What I am saying is your perception of an illusion (in the case of stereophonic audio and the magician) is what forms ones reality, correct? but that is misleading in the argument. This is where your logic is flying out the window. We are not talking about perception of the illusion. What has that got to do with anything??? The illusion is the perception, they are the same instance. Perceiving that there is an illusion has nothing to do with what we are talking about. This is text book misdirection/red herring. The reason that it is completely and utterly irrelevant is because the whole point of it is tricking your brain to feel sound is emanating from a point that it is certainly not. This is your perception. You perceive the sound coming from places beyond, between, above, the speaker. This is your PERCEPTION and it is an ILLUSION. This does not make it reality, because it certainly is not. I believe we can both agree. To perceive the perception/illusion is reality, technically, but it does not follow. If you're intentionally listening to stereo for the sole intention of tricking your mind , which we can all agree is what we are doing, and especially so as it pertains to this argument, then why in the world would you care about how one is perceiving the perception???? Because one is true does not make the other so. acknowledging your brain is being tricked does not make your brain untricked. It's is akin to saying a person is only self-aware if they are aware of being self-aware. The reason I am not understanding what you are saying has nothing to do with the time devoted to responding to it, it is because your arguments are poorly laid out and sloppily thrown together. I don't "feel your logic is twisted," your arguments are illogical. Severely. I will not make the assertion that this is a characteristic of you as a person, but think it more likely an oversight on your part, or simply a miscomprehension. In the statement above you are saying that one's perception is an illusion because what you are perceiving is an illusion, which is completely inaccurate. One can perceive an illusion and have their perception be real, correct? Just because stereophonic audio is an illusion does not make the act of perceiving an illusion, an illusion as well. How is this a "gross fallacy"? Are you saing because what you are perceiving is not real, therefore you perceiving it is not real? How then, would you know what is real or not? The "so what" is that when you hear differences in audio equipment after perceiving the audio produced by the equipment then the differences you perceive are real. That has been/is my point in bringing up the fact that the act of perceiving is real, regardless if what you are perceiving is real or not. but that is misleading in the argument. This is where your logic is flying out the window. We are not talking about perception of the illusion. What has that got to do with anything??? The illusion is the perception, they are the same instance. Perceiving that there is an illusion has nothing to do with what we are talking about. This is text book misdirection/red herring. The reason that it is completely and utterly irrelevant is because the whole point of it is tricking your brain to feel sound is emanating from a point that it is certainly not. This is your perception. You perceive the sound coming from places beyond, between, above, the speaker. This is your PERCEPTION and it is an ILLUSION. This does not make it reality, because it certainly is not. I believe we can both agree. How is my statement in the quote above a "misleading argument, poorly laid out and sloppily thrown together"? We are talking about listening to stereophonic audio. What is the act of listening to stereophonic audio? It is the act of perceiving the stereophonic audio signal, correct? Again, it seems you are saying that perception of an illusion and one's perception being an illusion are the same thing. THEY ARE NOT. The act of perecption is real (as evidenced by the sound waves coming from the speaker) while what you are perceiving is an illusion (as evidenced by the apparent sound of vocals, guitar, drums, bass, etc. throughout the soundstage). Perceiving an illusion has everything to do with what we are talking about since we are talking about listening (perceiving) to a sterephonic audio signal (illusion) and hearing differences between components and the audio they produce. There is absolutley no misdirection/red harring going on my part. I am absolutly spot on the argument here and am pretty clear in the statements I have made. The reason that it is completely and utterly irrelevant is because the whole point of it is tricking your brain to feel sound is emanating from a point that it is certainly not. This is your perception. You perceive the sound coming from places beyond, between, above, the speaker. This is your PERCEPTION and it is an ILLUSION. Again, you are perceiving an illusion, but your perception is not an illusion. Do you understand the difference between the two? They are not the same. I cannot make it any more clear than that. To perceive the perception/illusion is reality, technically, but it does not follow. If you're intentionally listening to stereo for the sole intention of tricking your mind , which we can all agree is what we are doing, and especially so as it pertains to this argument, then why in the world would you care about how one is perceiving the perception???? Because one is true does not make the other so. acknowledging your brain is being tricked does not make your brain untricked. It's is akin to saying a person is only self-aware if they are aware of being self-aware. 1) Projection: You are accusing me of showing the behavior you are in fact displaying. In this case, Saying that my arguments don't make sense, and are sloppily thrown together and illogical, when in fact it is you who is displaying this behavior. 2) Deflection: Instead of fully answering my posts, you summarize and make accusations trying to make me look like a fool but do not provide specific evidence of everything you are accusing me of. That must be the difference between you and I. I am not listening to my stereo in order to trick my mind, I am listening to my stereo equipment to listen to the soundstage, imaging, details etc. etc. etc. in order to enjoy the music. The fact that it is an illusion is just a consequence of listening to the stereophonic audio, but not the reason I am listening to the audio. Why would you care about how one is perceiving the illusion of stereophonic audio? Because this is directly related to bias and the ability to hear the differences between audio equipment. So yes, one's perception of the illusion (sterophonic audio) is crucial to this argument. I have already said previously that because one's perception is real (one's reality of perceiving the differences in stereophonic audio) does not make what they are perceiving real (the illusion of stereophonic audio). As far as you brain being tricked, that is what I am talking about with how distracted you are from perceiving reality. Your brain can be tricked into perceiving the illusion of stereophonic audio, but your brain potentially can be aware that it is being tricked, correct? This is of course you are not too distracted that you are being tricked. So, I disagree with you about the brain being tricked because your brain can be tricked into perceiving the illusion of stereophonic audio, yet you can be aware that you are being tricked that you are perceiving the illusion of stereophonic audio. You are wrong on that point (at least for me and my brain). For you, maybe you are not aware that you are being tricked. I don't know, that's up to you. You saying that a person is only self-aware if they are self-aware is redundant. If you are self-aware, of course you should be aware of being self-aware. this is assuming you are not lost in distraction to the point of losing your self-awareness temporarily. But, using your example of being self-aware you can perceive the illusion of stereophonic audio, but not perceive the differences stereophonic audio equipment produces. And the cause of not being able to perceive differences in audio equipment are distractions (or bias). Which is what this whole debate is about, correct? Pretty sure its still going on in the power cord dept. You tried to get out of it by summarizing my responses incompletely and you made accusations about what I said, but gave no evidence to pose a counterpoint. In the statement above you are saying that one's perception is an illusion because what you are perceiving is an illusion, which is completely inaccurate. This statement makes my brain hurt. How many times do I have to explain this??? You keep accusing me of not understanding the definition of perception, and then use it improperly in the same breath. This is exhausting. You posted the definition, shall I quote it for you so you don't have to scroll up to see it? look at item 1. look at it again. now look up at your post. ....Anything? If perception is the result of perceiving, and we both agree that what one is perceiving is an illusion, is the perception not illusory(aka not real)????? I am NOT saying One can perceive an illusion and have their perception be real, correct? Just because stereophonic audio is an illusion does not make the act of perceiving an illusion, an illusion as well. How is this a "gross fallacy"? because it is a red herring. You are arguing a point that is not the issue. It is a misleading statement. Again, we are not discussing whether or not the ACT of perceiving is is an illusion. That is irrelevant, and it has no standing in our conversation. Again, it is a gross fallacy. Are you saying because what you are perceiving is not real, therefore you perceiving it is not real? nope. you keep bringing this up, not me. You seem to think that "you perceiving something" is synonymous with "your perception." They are not the same thing. One is an action the other is an idea, a noun. How then, would you know what is real or not? n this case it is easy. does it exist or doesn't it? is the sound eminating from where it is perceived to be coming from? No it is not, therefore it is not real. pretty simple. Unless you meant philosophically, which is a difficult thing to definitively answer for anything, and I'm not such a **** to have a conversation of that depth here. The "so what" is that when you hear differences in audio equipment after perceiving the audio produced by the equipment then the differences you perceive are real. That has been/is my point in bringing up the fact that the act of perceiving is real, regardless if what you are perceiving is real or not. And my point is, just because you perceive something, it doesn't inherently make it, your perception, real. Would you agree that perception is personal? Moreover, would you agree that it is uniquely individual? If so, then how could one assure that one's perception is shared or relatable to another? And even so, how can one be assured that the perception is not influenced by a set of unique circumstances that couldn't possibly be quantified or reproduced, especially if the listener is wholly unaware of them. technically not correct, but let's let that slide. Again, it seems you are saying that perception of an illusion and one's perception being an illusion are the same thing. while what you are perceiving is an illusion (as evidenced by the apparent sound of vocals, guitar, drums, bass, etc. throughout the soundstage). Perceiving an illusion has everything to do with what we are talking about since we are talking about listening (perceiving) to a sterephonic audio signal (illusion) and hearing differences between components and the audio they produce. Correct! now you're catching on. The problem is when you try to bring in the "act of perceiving" into the argument is the problem. There is absolutley no misdirection/red harring going on my part. I am absolutly spot on the argument here and am pretty clear in the statements I have made. you have your opinions, I have mine. You are backpedaling here. You said above that my argument does not make sense, yet you agree with it in the first part of the statement above. Then, after backpedaling and agreeing with me you still try to disagree with me. This is most certainly not back pedaling. I agreed to one premise from within your inference, while at the same time, stating the very same premise was irrelevant. those words were probably stronger than I should have used, but still true. If you would like to show where my logic has failed, I am game, but seeing as how you have not done so, this is just a baseless accusation. My intention truly is not to make you look like a fool. You seem to have taken great offense to me not completely dissecting your post that ONE TIME. Hopefully you are happier this time around. Again, brevity is a long ways away from deflection. That must be the difference between you and I.
I am not listening to my stereo in order to trick my mind, I am listening to my stereo equipment to listen to the soundstage, imaging, details etc. etc. etc. all of which are a result of your mind being tricked! no. the fact that it is an illusion is not a consequence of listening to stereophonic audio. the fact that it is an illusion is the consequence of nothing. it is a fact because it is true and thats it. facts are not consequential. but not the reason I am listening to the audio. Why would you care about how one is perceiving the illusion of stereophonic audio? Because this is directly related to bias and the ability to hear the differences between audio equipment. So yes, one's perception of the illusion (sterophonic audio) is crucial to this argument. I have already said previously that because one's perception is real (one's reality of perceiving the differences in stereophonic audio) does not make what they are perceiving real (the illusion of stereophonic audio). ok, so why bring it up at all? because you ARE the one who brought it up. As far as you brain being tricked, that is what I am talking about with how distracted you are from perceiving reality. Your brain can be tricked into perceiving the illusion of stereophonic audio, but your brain potentially can be aware that it is being tricked, correct? This is of course you are not too distracted that you are being tricked. So, I disagree with you about the brain being tricked because your brain can be tricked into perceiving the illusion of stereophonic audio, yet you can be aware that you are being tricked that you are perceiving the illusion of stereophonic audio. You are wrong on that point (at least for me and my brain). no, I'm not. You can't "untrick" your brain. While you can be aware that the audio is coming out of two seperated speakers which is causing your brain to think the sound is emanating from a point between the two, you cannot then discern and identify two separate signals coming from their proper sources. The fact that you are aware there is an illusion happening does not counteract the illusion, but it does effect the unique circumstantial experience. For you, maybe you are not aware that you are being tricked. I don't know, that's up to you. You saying that a person is only self-aware if they are self-aware is redundant. If you are self-aware, of course you should be aware of being self-aware. this is assuming you are not lost in distraction to the point of losing your self-awareness temporarily. ok this point was lost on you, that's ok. let's just leave it. there are plenty of other points in here. But, using your example of being self-aware you can perceive the illusion of stereophonic audio, but not perceive the differences stereophonic audio equipment produces. And the cause of not being able to perceive differences in audio equipment are distractions (or bias). Which is what this whole debate is about, correct? I'm sorry, I just can't make heads or tails of this last bit. I think I need to say this, as it seems you might be taking some of this personally with the mention that it is my intention to make a fool of you:there is nothing personal about this. I think of all of you as friends of sorts, even grumpy h9 who likes to get his jabs in when he can. And maybe no one thinks of me in the same way, but it doesnt change my feelings. but seriously, I just like debate and logic, and any chance I get to exercise it, I do. Hopefully you understand.